In the development of our new sunscreen formulations, we have created a range of products using non-nano mineral UV filters. Bernhard Irrgang, responsible for Research & Development of Natural and Organic Cosmetics at Weleda, explains why. What exactly are mineral-based sunscreens? Mineral-based sunscreens reflect the sun’s rays like countless small mirrors to protect the skin from sunburn. They contain particles of minerals such as titanium dioxide and zinc oxide, which can be used in different sizes to physically block the sun’s UV rays. When the average size of these mineral particles is between 1 and 100 nanometres (1 nanometre = 1 billionth of a metre), they are referred to as nanoparticles. Do nanoparticles have harmful side effects? Nanoparticles should not be inhaled. Although nanoparticle-based sunscreens are classified as safe by the beauty industry regulators, many customers have reservations about their use. There are also no conclusive results as to the impact of nanoparticles on our physical health. 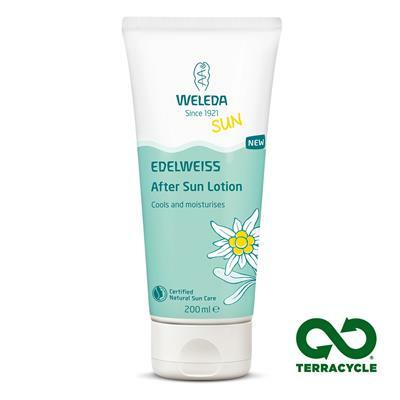 In order to be able to offer a suitable alternative to synthetic sunscreens, we have decided to develop productswith non-nano sunscreen ingredients. Why does mineral-based sunscreen make our skin look white? As I mentioned before, mineral sun filters reflect sunlight. The larger their particles, the better they reflect visible light, and our eyes perceive this as a whitish colour tint. So when mineral-based sunscreen is applied to the skin, it leaves a pale sheen. The higher the sunscreen formulation’s sun protection factor (SPF), the more prominently it whitens the skin. For babies and toddlers – who should wear sunscreen with a high SPF – this effect is not necessarily a drawback: parents can immediately see whether their children still have enough sunscreen on their skin. In order to reduce whitening, a sunscreen formulation would have to use nanoparticles, which reflect more in the invisible UV range. 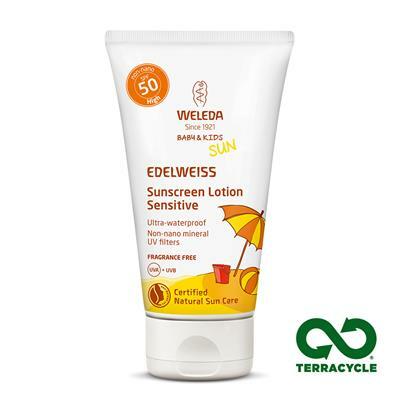 Is Weleda Edelweiss Sunscreen waterproof? Is its protection reduced when we swim or sweat? 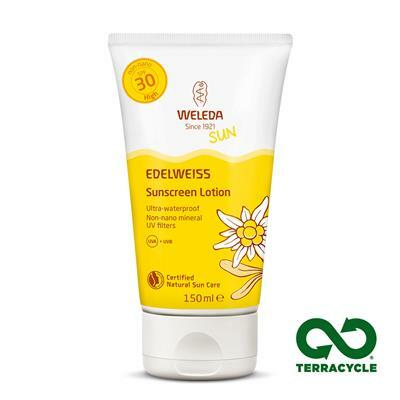 Weleda Sunscreen with its mineral-based UV filters has been developed so that the sunscreen adheres better to the skin; it’s not merely waterproof, but “extra waterproof”. This is especially good for children who are playing in water or swimming. It’s also advantageous for people doing sports and sweating in the sun, as well as hikers in the mountains or skiers. But even “extra waterproof” doesn’t guarantee that 100% of the sunscreen will remain on the skin during swimming or sweating. That’s why it’s important to keep in mind that sunscreen should be re-applied regularly to ensure its full effect. Dr. Bernhard Irrgang is responsible for Research and Development of Natural and Organic Cosmetics at Weleda. He has been working in the cosmetics industry for 27 years and has extensive experience in the field of sun protection. After sundown, enjoy a relaxing shower in the evening using the gentle Weleda Birch Body Scrub. Then pamper your skin with the new Weleda After Sun Lotion.